Here’s a delicious and healthy snack that Ralph and I always have about an hour prior to going to bed. I always have a platter with a variety of fresh fruit so it’s easy to make dessert. 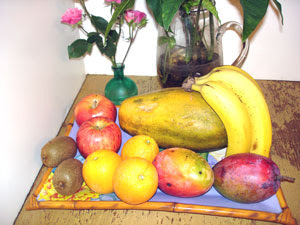 When fruits are in season and in abundance, go get some! 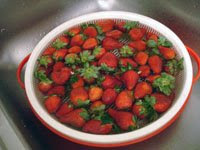 Recently strawberries were $4 or 5 pints! I freeze some and have fresh with oatmeal for breakfast cooked in my wok. We cook nearly everything in my cast iron wok which sits conveniently on my portable butane gas stove right on top of my electric coil. We never put ours away because if you don’t see it, you won’t use it. We call it our “mini-meal”, I have low sugar, inherited from my mom who has diabetes and my brother passed away from it. Over the years, I have donated a lot of WokStar cooking class certificates to the local Diabetes Research Institute and also invited many of the staff to attend. I hope they will be able to spread the word that having diabetes does not have to be doom and gloom. There are many quick, healthy, delicious foods we can eat. My doctor is pleased that my “diet” is so good that I don’t need to be on drugs. I wrote a whole page about Health and Diet on my website. I have to keep topped up but not with just fruit because it’s all sugar. So, I was surprised and disappointed to see at local fundraising festivals, the Junior Diabetes booth was selling CANDY or cakes and said so. With childhood obesity such a huge problem, I am flabberghasted to read constantly in the papers chefs teaching kids how to bake cookies and cakes. 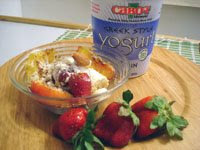 What works for me is balancing fruit with protein, otherwise you have a sugar high and deep dip. If I don’t have this, I’m “starving” in the middle of the night and my tummy growls so loud, it wakes me up. I add protein powder (Wholefoods brand is cheapest) and / or textured protein (bulk section at Wholefoods), then top with dollop of Cabot’s Greek Style yogurt (has live active cultures, good for building up immune system, available at Publix and most supermarkets). I just discovered Cabot and love this, it’s very creamy like double cream in England. Also, I feel like I’m supporting the dairy farmers in Vermont, cause it’s owned by them, so show your support and try it. Not done yet, add liberal sprinkling of ground flax seed (I grind myself, otherwise it’s indigestible) which is good fiber, hit of granola (get bulk at Wholefoods, much cheaper than packaged), a few toasted almonds (I toast our own from Costco) for crunch, sometimes also add quinoa flakes and viola. We look forward to this every night. Catholic and Gallaudet Universities, in addition to campuses for John Hopkins, Strayer and Argosy Universities. Arif jumped up and locked his bedroom door, thinking ‘take whatever you want. trails, where guests can enjoy hiking, skiing, biking and snowshoeing.